That marks a 17% gain from $4.6 trillion in 2014, according to a recent economic impact study of the nation’s ports by Martin Associates. The Lancaster, Pa.-based firm disclosed its “2018 National Economic Impact of the U.S. Coastal Port System” report on March 20 during a meeting of the American Association of Port Authorities. The increase accounts for nearly 26% of the nation’s $20.5 trillion economy in 2018 — the same ratio as five years ago when the total U.S. GDP was $17.4 trillion, the firm said. The sizable growth over the past five years emphasizes the importance of deep-draft ports, said John Martin, president and founder of Martin Associates. “The growth in jobs and economic value of America’s ports reflects their handling an additional 165 million tons of international cargo since 2014. It also underscores the importance of both the public and private sectors continuing to invest in port and intermodal infrastructure,” he said. Between 2014 and 2018, the total number of jobs supported by cargo moving through America’s deep-draft ports increased to 30.8 million from 23.1 million. Federal, state and local tax revenues generated by the port sector rose nearly 18% to $378.1 billion from $321.1 billion. Personal wages and local consumption rose to $1.4 trillion from $1.1 trillion. Average annual salary of those directly employed by port-related businesses rose 17% to $62,800 from $53,723. 2018 was a spectacular year for all of the nation’s major ports with several setting 20-foot-equivalent container volume records. For example, the nation’s busiest outlet, the Port of Los Angeles, finished 2018 processing a record 9.45 million TEUs compared with 9.34 million in 2017. 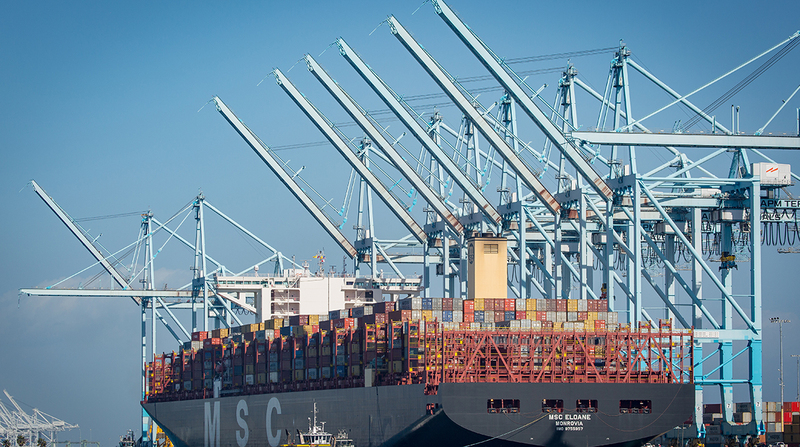 Long Beach, the second biggest port, finished 2018 with a record 8.1 million TEUs compared with 7.5 million in 2017. And the Port of New York/New Jersey, which is the third largest, handled a record 7.2 million TEUs compared with 6.7 million in 2017 — marking the first time the facility exceeded the 7 million-TEU mark. “Across the board, across the country our ports saw significant increases in their operations in 2018,” Nagle said. He assessed the need for federal investment at $66 billion over the next decade. “These necessary federal channel, terminal, road, rail, bridge and tunnel improvements are crucial to enable our seaports to efficiently handle their expected cargo volumes, continue providing dramatic economic and jobs impacts, and enhance America’s international competitiveness,” Nagle said.